Ford chose to show off the 2020 Explorer this week, and the big news is that its three-row crossover has gone rear-wheel drive again. Ford says it plans to offer both an ST version and a hybrid, but the base model will get a 2.3-liter turbo-four and a 10-speed automatic transmission. And if 300 hp and 310 lb-ft of torque isn’t enough for you, the top-of-the-line version gets a 3.0-liter twin-turbo V-6 that cranks out 365 hp and 380 lb-ft of torque. But how does the new Explorer’s design compare to the previous one? Up front, the Explorer has a softer look than before. You can tell it’s wider than the last-gen Explorer was, but the shape of the headlights is less aggressive. In fact, from some angles, it even looks like it’s smiling at you. From the side, though, it’s a different story. 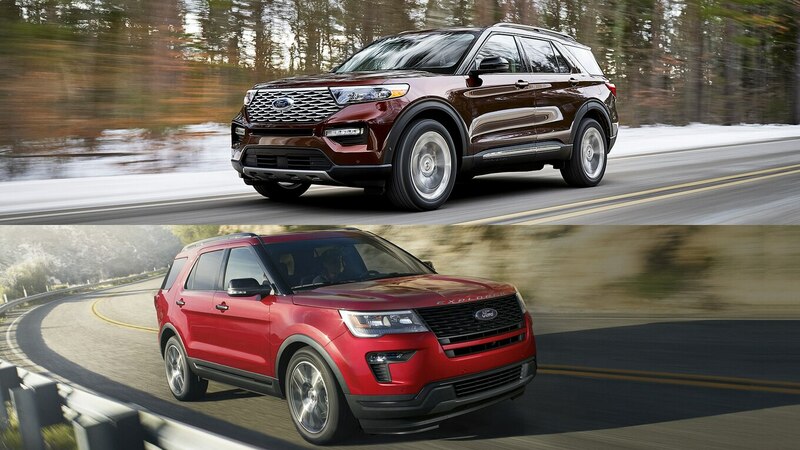 The profiles of both SUVs look similar at first glance, but look closer, and you’ll notice the new Explorer has a much sportier design. From the short front overhang to the gently sloping roofline, the styling has a much leaner, more athletic look. Out back, it’s a similar story. Even though you can see a lot of similarities between the two, we prefer the new Explorer’s updated rear end. Inside, Ford got rid of the sea of plastic that was the center console, and in general, we like the more premium-looking cabin. But one design choice is probably going to be extremely controversial. Instead of integrating the infotainment display into the dash, there’s now a huge vertically oriented screen that sticks straight out of the center console. It’ll probably be easy to read, but customers who don’t like tablet-like displays are really not going to like this. As far as pricing goes, Ford says the base model will only be $400 more expensive than the current Explorer. Assuming the destination charge stays the same, that means the 2020 Explorer will start just under $34,000. Don’t be surprised, however, if some of the most expensive models are all priced well above $50,000 when new Explorers start showing up on dealer lots this summer.